A coalition of agencies, workers and their union, and families of individuals with developmental disabilities is renewing its push to raise poverty wages for direct support personnel (DSPs) who work for private, non-profit agencies that contract with the state of Illinois to serve disabled individuals. Coalition members will be at the state Capitol on Wednesday (May 10) to lobby lawmakers, hold a news conference and deliver thousands of postcards to Governor Rauner’s office in support of two bills (SB 955 – Steans/HB 2960 – Gabel) that would raise the reimbursement rate the state pays to provider agencies for the first time in nine years. 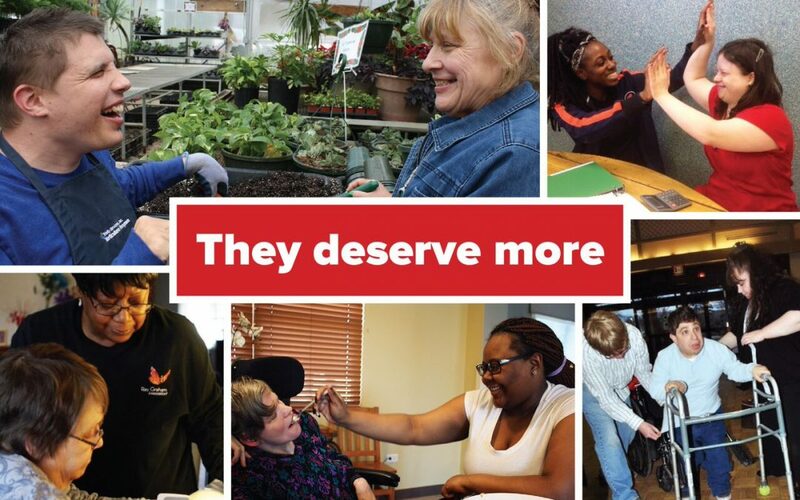 More than 34,000 DSPs support 27,000 individuals with disabilities across Illinois. But because DSPs are paid just $9.35 an hour – below the poverty line for a family of three – provider agencies are unable to retain or hire adequate staff. As a result, dedicated DSPs are unable to provide for their families and quality of care for individuals with disabilities suffers. WHEN: Wednesday, May 10 at 1:30 p.m.
After the General Assembly last year passed a bill to raise wages to $15 an hour, Governor Rauner vetoed it, claiming that DSP wages should be addressed as part of a comprehensive state budget. However, Rauner’s FY18 budget introduced in February included no such increase. As a consequence of the state’s failure to pay adequate wages, a federal court monitor has found the Illinois Department of Human Services is out of compliance with the Ligas consent decree that ensures people with developmental disabilities can access the services and supports they need in the setting they choose.